People are often hesitant when they're suggested that they paint the rooms with vivid colours, because they are not sure if they match the style and architecture of their home. 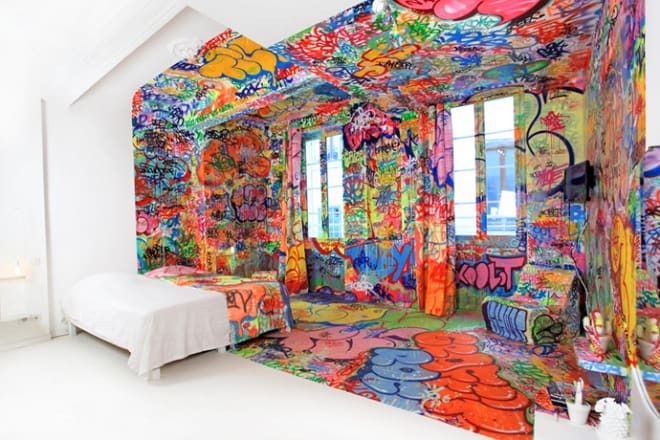 Forget about this preconception and have a look at this extravagant bedroom with statement, street-style painting. One half of the room is pristine white, while the other half is the explosion of all kinds of colours. Would you dare try this decoration idea in your own home?